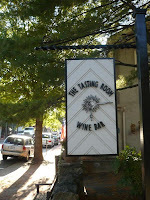 Virginia is becoming well known for producing two very good vinifera wines: Viognier and Cabernet Franc. Recently we opened a bottle of perhaps our favorite Virginia-made Cabernet Franc from this season, Fincastle Vineyard & Winery's Cabernet Franc 2004. Since Fincastle is located at the southwestern part of the state, it is difficult for us in the northern part to sample their wines. However we were able to get our hands on this bottle at a state wine festival earlier this year. Their Cabernet Franc us a full bodied red wine that has been aged 12 months in American oak. It has a very fruit forward nose and flavor - with a long dry finish as the cherry flavors flow from start to finish. We hope to visit the winery soon to see what other gems they produce. On a recent trip to the Graves Mountain Lodge Apple Festival we snuck into nearby Christensen Ridge, located a few miles south on Route 231. While driving to the winery, you pass through rolling hills of cattle pasture and even drive through a working farmyard – before reaching the secluded winery and guest houses. Yes, guest houses – each rentable for weekends, weddings, business retreats, etc. During our visit, there was a steady stream of people who had navigated their way up the driveway, many returning home from the Apple Festival or from sightseeing in the Blue Ridge Mountains. Christensen Ridge offered four wines during our tasting; but they plan to offer a larger selection as the winery expands. Their vineyard includes some of the oldest vinifera vines in Virginia as well as newer plantings of Viognier, Petite Verdot, Petite Manseng, and Norton. The first wine was the 2002 Viognier, the Virginia specialty. This wine is very good with an apricot flavor and a refreshing, slightly acidic finish. Next we tried their 2002 Chardonnay, which we liked more than the Viognier. Normally, we pass on the Chardonnay, but this wine is good. It was even better drinking on their patio. The reds did not have an effect on us as much as the whites. Their medium bodied 2002 Merlot has a nice cherry flavor and a smooth finish; whereas their 2002 Proprietors’ Tuscan Blend is stronger with a spicier finish. This wine is a blend of Sangiovese, Merlot, and Cabernet Sauvignon – primarily because a few years back a vineyard owner visited Christensen Ridge trying to sell these grapes. Feeling sorry for the man, the winemaker purchased the fruit and a wine was born. A few years in the cellar should really bring out the cherry flavors. Christensen Ridge is not far from Route 29, so we plan on making the winery a stop on our trips to Charlottesville, particularly if they continue to serve their homemade barbecue on the weekends. The winery closes from late November to early February – so you don’t have much time to visit this year. Wine-Compass.com is pleased to be a contributer to a new music site: MyJoog.com. The site allows any user to add an artist, venue, or music event to the site as well as review artists and share events with friends. We will be responsible for loading winery music events such as the summer concert series at Tarara Winery Linganore Wine Cellars, and Grande River Vineyards. If you know of any music events that are not loading into MyJoog.com or Wine-compass.com; please let us know - or you can add the event yourself on each site. Thanks. If you are looking for something a little different we recommend the Austrian wines from Anton Bauer. A 4th generation winemaker, Mr. Bauer produces wines from several grapes acclimated to central Europe such as Riesling, Welschriesling, Blaufränkisch and Zweigelt. Our favorite is the Reserve Wagram 2005, a blend of Cabernet Sauvignon, Blaufränkisch, Syrah, and Merlot. This wine has a strong cherry flavor balanced with a long smoky finish. This is your steak wine. We were recently able to purchase their medium bodied Wagram Cuvée No 10 Wagram 2004 - a blend of Blaufränkisch, Zweigelt, Cabernet Sauvignon, and Merlot. This wine had a similar cherry flavor, but a much mellower finish - even after aging 15 months in French oak. Here's your pasta wine. You can also read more about Blaufränkisch and Zweigelt at the WineCompass Wine 101 page. While driving through the small village of Middleburg, I noticed that Boxwood Winery's long anticipated satellite tasting room had finally opened. Boxwood's winery complex is only open by appointment only so they opened a tasting room in the middle of Middleburg, convenient for local residence and tourists. Boxwood produces Bordeaux style wines with the consultation of famed wine maker Stephane Derononcourt. Currently they have released two wines; a dry Rosé and a Bordeaux blend Topiary. So that you can compare their offerings with other Bordeaux wines, Boxwood has installed an Enomatic machine loaded with several famous Bordeaux wines and their Topiary. And their wines are excellent. I missed including the dry Rosé in our blog posting of local rosé wines by a day. This rosé has a great fruit aroma with a strawberry flavor and a smooth, refreshing, dry finish. The Topiary is a full bodied blend of Cabernet Franc, Merlot, and Petit Verdot. The nose is amazing - the exact same as many of the Bordeaux wines we recently tasted at the Bordeaux 100 event. The rest of the wine is smooth - from the black cherry flavor to the long finish. Visiting Middleburg has also been a worthwhile en devour. Now you have one more reason to visit: a chance to sample extraordinary Bordeaux style wines. Lately we have been able to taste four very good dry rosé wines from Maryland and Virginia that are welcome alternatives to the sweet blush style wines. Maryland's Deep Creek Cellars offers a dry Rosé made from Cabernet Franc that is fruity and has a nice acidic finish. On the other side of the state, Solomons Island Winery offers a White (Rosé) Merlot. This Maryland Governors Cup Competition-Gold Medal wine is made in the style of the dry Rosés from Provence. This mat be my favorite. And in Virginia Chrysalis Vineyards and Bluemont Vineyards produce similar style rosé made from several grapes. The Chrysalis Mariposa is a Spanish style Clarete made from seven European varieties and a little Norton for color. The Bluemont Rosé - "The Donkey" is a blend of five varieties - Tannat, Tinta Cao, Nebbiolo, Viognier, and also a splash of Norton for color. Its nice to see dry rosé wines back vogue. This week I tried my first Pinotage wine, the 2005 from Beyerskloof Winery. The wine was recommended by one of our local wine stores, Out of Site Wines. I'm not sure if all Pinotage wines taste similar, but this was very interested. The wine is dry and full bodied with an initial plum flavor. However that flavor quickly turns spicy into a long smoky finish. And I mean smoky - reminiscent of some single malt scotches. After the first startling sip, I gradually became accustomed to the smokiness and found that the wine mellowed after decanting. It also went down well with sausage pizza. If you want to find out more about Pinotage check out The Pinotage Club and wait for a future Wine 101 article.